El Portal lies in the Merced River Canyon along Highway 140, just outside Yosemite's Arch Rock entrance. 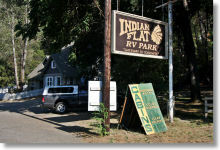 Lodging options include two large midrange motels, the Yosemite View Lodge and the Cedar Lodge; a bed & breakfast (the Blue Butterfly); and an RV park. The Yosemite View and the Blue Butterfly are both right on the Yosemite boundary (though the actual entrance gate is two miles inside the park), while the Cedar Lodge and the Indian Flat RV Park are another seven miles farther west. El Portal is a popular base for Yosemite visitors, and reservations are highly recommended if you want to stay here in the summer. Pro: This is as close as you can get to Yosemite Valley without being in the park. Con: You may initially think that the gas prices in El Portal are listed in yen. But no, those are dollars. Shopping: Basic. The El Portal Market burned down in 2008 but has since been rebuilt next to the gas station and reopened in the summer of 2009. (The original version is pictured above.) The new incarnation is about the size of a gas store convenience mart. There's a gift shop at the Cedar Lodge and a larger gift shop/convenience mart in the Yosemite View Lodge. You can buy rather expensive gas here if you've got a credit card (the station, recently reopened, is currently pay-at-the-pump only). If you're staying in one of the kitchenette rooms in the Yosemite View Lodge and you need to stock up on groceries, there's a full-sized market in Mariposa, about 30 miles (50 km) west; if you're arriving via Highway 140, you'll pass it en route. There's another market in Yosemite Village that, while not a full-sized grocery, is larger than any of the options in El Portal. ATM Machines: There's an Americawest ATM at the Yosemite View Lodge. Medical Help: Nothing in El Portal itself. There's a hospital in Mariposa, roughly 30 miles (50 km) west, and a medical clinic	in Yosemite Village. The Yosemite clinic isn't open 24 hours, but paramedic/ambulance services are available round the clock. If your injuries are spectacular enough, you'll get airlifted out by helicopter. Entertainment: For locals, the great social event is the biweekly arrival of the taco truck, which is probably all you need to know about the after-hours scene in this tiny community. There are bars at the Yosemite View Lodge and the Cedar Lodge, and if you're staying at the Blue Butterfly Inn, you can stargaze through the owners' collection of telescopes. Really, though, you're probably best off going to bed early so you can get up with the sun and spend as much daylight as possible under Yosemite skies.